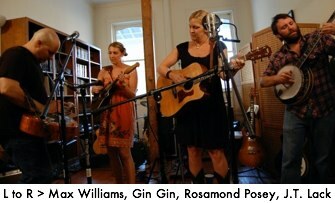 The house band was comprised of local musicians Gin Gin Abraham (Double Date), Rosamond Posey (Rocket 88) , J.T. Lack (Mayhem String Band) and Max Williams (Kudzu Kings, George McConnell and the Nonchalants) who kicked off a three-song set with the Music In The Hall Theme Song. George McConnell and the Nonchalants followed the house band. McConnell, a Vicksburg native now residing in Oxford, has played in a variety of bands through the years including Beanland, The Kudzu Kings and Widespread Panic. 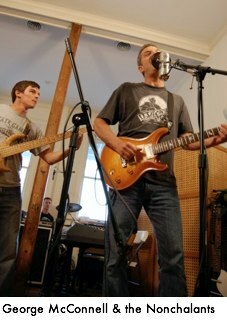 The Nonchalants perform Beanland covers and Nonchalant originals, encompassed with that ever-welcomed McConnell twang on both guitar and vocals. Backed by Max Williams, Tommy Turan and drummer Kenny Graber, the Nonchalants boast a tight sound, and have been touring throughout the South recently. 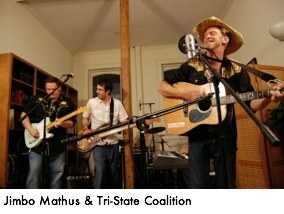 The show was closed out by Jimbo Mathus and the Tri-State Coalition. Mathus is one of the most versatile musicians out there, and in addition to recently reuniting his former band, The Squirrel Nut Zippers, he’s also joined Luther Dickinson (North Mississippi Allstars, The Black Crowes) and Grammy-winner Alvin Youngblood Hart to form the South Memphis String Band. While I’ve seen first-hand what Mathus & His Knockdown Society can do with some dirty Clarksdale, Mississippi blues, the Tri-State Coalition’s sound is reminiscent of the country-blues style the Rolling Stones turned into Beggars Banquet. The Coalition is rounded out by Justin Showah (Taylor Grocery Band, Cary Hudson Trio) Austin Marshall, Matt Pierce, Eric Lewis & Eric Carlton. Steve McDavid, with whom Morrow shares office space, complained to Morrow about the lack of shows for the “older” (30,40, 50 year old) Oxonians who do not want to stay up all night and would prefer a show to start around 6 or 7 P.M., so they can make it to work in the morning. Around this same time, Morrow had attended a couple of house concerts which left an impression on him. “One night I was sitting with Steve and it just all came together,” says Morrow. 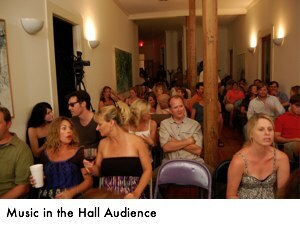 “I looked at Steve and said ‘Let’s clear the hall.’” And so the oldest building on the Oxford Square – and the first one rebuilt after the Civil War – became host to Oxford’s newest music show. For the first event, they borrowed Pete Cleary’s microphones (typically used to record live concerts), while Joe York of the Ole Miss Media & Documentary Projects Center manned the camera. 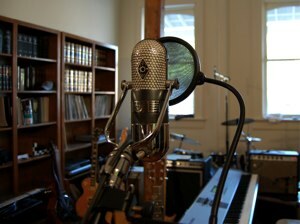 For their second show, Morrow was determined to improve audio quality, so he called in local recording engineer Andrew Ratcliffe of Tweed Recording. Funding for Music In The Hall comes from Morrow and McDavid’s own pocket – but with gracious help from Wayne Andrews and the good folks at the Yoknapatawpha Arts Council who not only loan the sound system to MITH, but also donate, set up and take down the chairs. Their goal of attracting enough paying attendees to pay for the cost of equipment and DVD production seems close (as a DVD is included with every $10 entrance fee). Presently, MITH incurs the costs of recording, mixing and editing the shows, but York is teaching Morrow to edit himself to keep costs down and more quickly reach a break-even point. They’ve recently finished mixing June’s Episode 4 (he’s promising great things), and show attendees will be able to pick up a copy of the DVD at Holli’s Sweet Tooth on the Square. 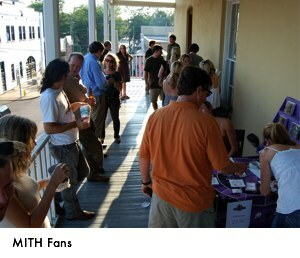 If you weren’t able to attend, clips – and DVDs – of prior shows are all available on the MITH website. Sample performances include Mayhem String Band, Sleeping Bulls, Amy LaVere, Rocket 88, Mister Baby, Shannon McNally, Avenue Hearts, and Jeff Callaway. The goal is to have one episode per month. Morrow is not sure of the exact date as he has to coordinate the schedules of Ratcliffe, York and the bands but be on the lookout for your next invite near the end of July. Like prior shows, Episode 6 is sure to have some very special guests. Man, do I miss Oxford.